I guess they are getting some morons in the advertising world these days. 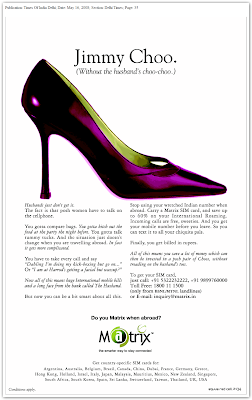 I see some horribly sexist adds around in the magazines & on TV these days too! Le blech! That is without a doubt one of the more disgustig ads I've seen. Almost makes you want to NOT buy matrix cards. NGAC... Wooo Hooo. Did I tell you that my son is leaving for Amity this month? He got an admission for the BSc(hons) Medical Biotechnology course! Hey Mona, that's great! Congratulations to you both!